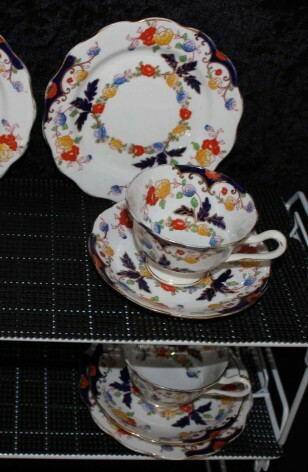 Antique - Royal Albert Crown Fine Bone China, Bognor Pattern #7873, Trio Tea Setting, Manufactured from 1927 to 1935 - PRICED AS INDIVIDUAL THREE PIECE, TRIO SETTINGS. Should you desire additional Settings, while they last, simply "Click" on the Quantity Button. This Antique "Bognor" Pattern #7873, by Royal Albert is Hand Enameled, in the Imari Style, Having Multi-Colored Floral Center Wreath, Surrounded by Similar Flower Wreath on the Outer Edge of Plates. Also having Cobalt Blue Sections at Rim, with Partial Red Flower. All Pieces are Trimmed in 22kt Gold, and items are Scalloped. Lovely Bright Colors that Enhance any Party. All in great condition. This Antique "Bognor" Pattern #7873, by Royal Albert is Hand Enameled, in the Imari Style, Having Multi-Colored Floral Center Wreath, Surrounded by Similar Flower Wreath on the Outer Edge of Plates. Also having Cobalt Blue Sections at Rim, with Partial Red Flower. All Pieces are Trimmed in 22kt Gold, and items are Scalloped. Lovely Bright Colors that Enhance any Party. All in Very Good Resale Condition unless noted below or in pictures. 1 - Dessert/Bread/Tea Plate - 7"